These new watch faces target tourists and business travelers (Tourist), as well as lovers of outdoor activities and sports enthusiasts (Outdoors and Sports). The Sports watch theme comes in six colors, while the other two only offer four color options each. New watch faces usually sound boring, but Samsung's latest three ones are quite useful and look pretty good. 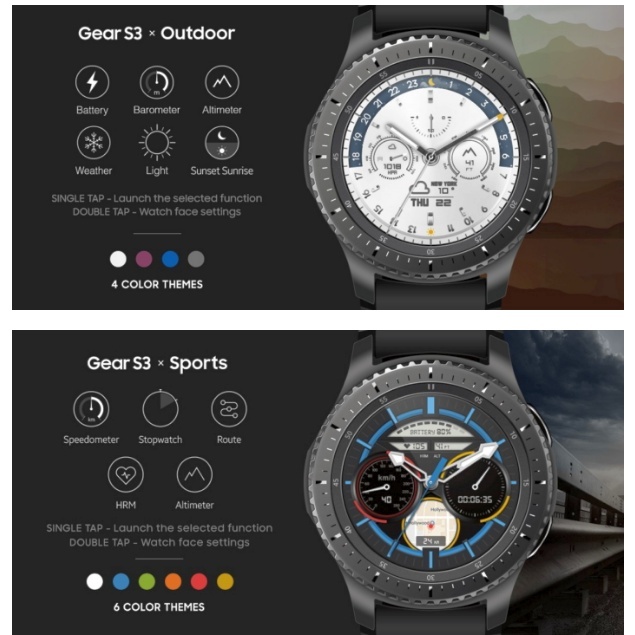 The new functional watch faces for the Gear S3 are suggestively named Travel, Sports, and Outdoor. The Travel watch face only shows two time zones, next to temperature info, local currency rate, as well as a shortcut to a map the shows the distance traveled. The Sports watch face brings forward the altimeter, heart-rate monitor, speedometer, stopwatch, and route information. At last, the Outdoor watch face shows the time of the day, as well as the altitude, battery level, atmospheric pressure, sunrise and sunset times, light level, and more weather information. The Travel and Outdoor watch faces have four color themes to choose from, while the Sports face comes with six colors to choose from. All the new watch faces come with single-tap and double-tap actions and can be downloaded for free via the Gear App Store.